This year, artist Jean-Michel Basquiat would have turned 50 years old. And in half-century celebration, there are events all over the world: In Paris, you can see more than 100 of his works at the Museum of Modern Art through January 2011, as well as a special exhibition at Galerie Pascal Lansberg. 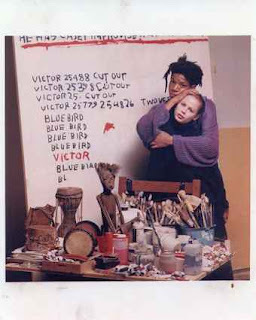 In other cities, you can catch Tamra Davis’s new documentary, The Radiant Child, centered on an interview the director shot with Basquiat 20 years ago. And in New York, a Basquiat exhibition was on display for much of the fall at the Robert Miller Gallery, in Chelsea. But in Los Angeles, there resides a much more personal collection. At LeadApron, a gallery on Melrose Place, gallerist Jonathan Brown has an unusual collection of ephemera: 112 pieces belonging to Basquiat, including self-portraits and even the signature bow tie he wore in his hair, all from the last year of his life.